66 D I V E R S I T Y W O M A N Fa l l 2 0 1 7 d i v e r s i t y w o m a n . c o m Running Shoes L indsay Siddiqi, the Brooklyn store manager of JackRabbit, a national running franchise, says running—a repetitive-motion activity— can be hard on your back and joints, and well-cushioned running shoes are designed to soften the skeletal impact. 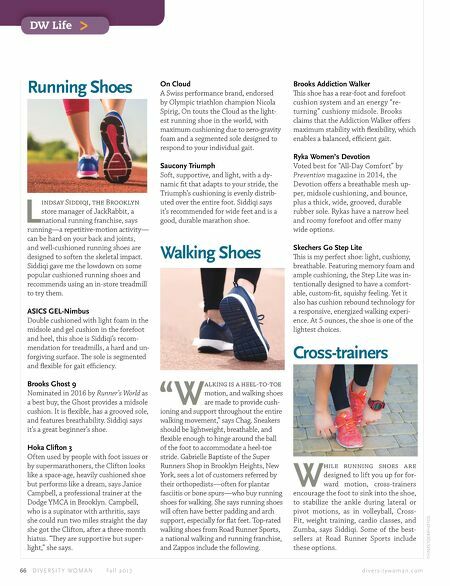 Siddiqi gave me the lowdown on some popular cushioned running shoes and recommends using an in-store treadmill to try them. ASICS GEL-Nimbus Double cushioned with light foam in the midsole and gel cushion in the forefoot and heel, this shoe is Siddiqi's recom- mendation for treadmills, a hard and un- forgiving surface. e sole is segmented and flexible for gait efficiency. Brooks Ghost 9 Nominated in 2016 by Runner's World as a best buy, the Ghost provides a midsole cushion. It is flexible, has a grooved sole, and features breathability. Siddiqi says it's a great beginner's shoe. Hoka Clifton 3 Often used by people with foot issues or by supermarathoners, the Clifton looks like a space-age, heavily cushioned shoe but performs like a dream, says Janice Campbell, a professional trainer at the Dodge YMCA in Brooklyn. Campbell, who is a supinator with arthritis, says she could run two miles straight the day she got the Clifton, after a three-month hiatus. "ey are supportive but super- light," she says. THINKSTOCKPHOTOS DW Life > On Cloud A Swiss performance brand, endorsed by Olympic triathlon champion Nicola Spirig, On touts the Cloud as the light- est running shoe in the world, with maximum cushioning due to zero-gravity foam and a segmented sole designed to respond to your individual gait. Saucony Triumph Soft, supportive, and light, with a dy- namic fit that adapts to your stride, the Triumph's cushioning is evenly distrib- uted over the entire foot. Siddiqi says it's recommended for wide feet and is a good, durable marathon shoe. Walking Shoes "W alking is a heel-to-toe motion, and walking shoes are made to provide cush- ioning and support throughout the entire walking movement," says Chag. Sneakers should be lightweight, breathable, and flexible enough to hinge around the ball of the foot to accommodate a heel-toe stride. Gabrielle Baptiste of the Super Runners Shop in Brooklyn Heights, New York, sees a lot of customers referred by their orthopedists—often for plantar fasciitis or bone spurs—who buy running shoes for walking. She says running shoes will often have better padding and arch support, especially for flat feet. 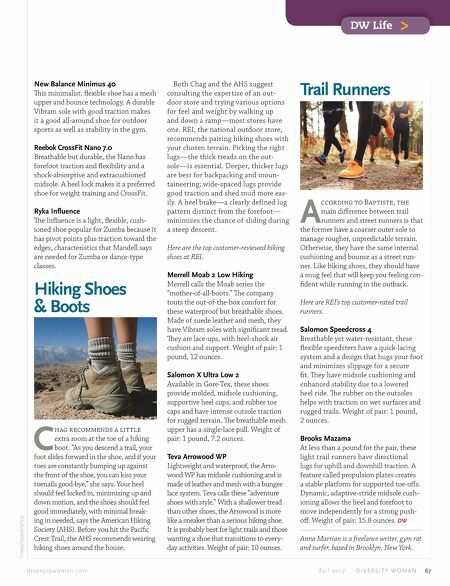 Top-rated walking shoes from Road Runner Sports, a national walking and running franchise, and Zappos include the following. Brooks Addiction Walker is shoe has a rear-foot and forefoot cushion system and an energy "re- turning" cushiony midsole. Brooks claims that the Addiction Walker offers maximum stability with flexibility, which enables a balanced, efficient gait. Ryka Women's Devotion Voted best for "All-Day Comfort" by Prevention magazine in 2014, the Devotion offers a breathable mesh up- per, midsole cushioning, and bounce, plus a thick, wide, grooved, durable rubber sole. Rykas have a narrow heel and roomy forefoot and offer many wide options. Skechers Go Step Lite is is my perfect shoe: light, cushiony, breathable. Featuring memory foam and ample cushioning, the Step Lite was in- tentionally designed to have a comfort- able, custom-fit, squishy feeling. Yet it also has cushion rebound technology for a responsive, energized walking experi- ence. At 5 ounces, the shoe is one of the lightest choices. Cross-trainers W hile running shoes are designed to lift you up for for- ward motion, cross-trainers encourage the foot to sink into the shoe, to stabilize the ankle during lateral or pivot motions, as in volleyball, Cross- Fit, weight training, cardio classes, and Zumba, says Siddiqi. Some of the best- sellers at Road Runner Sports include these options.